Legumes are a very important part of our meals. In my family, I have seen my mom cook dal for every meal. Be it an accompaniment for paratha, roti or rice, dal is always there. Among the all types of legumes found in the market, the one that is very popular in my family is the masyr dal, that too it is cooked in a very simple but special way. It tastes so good. 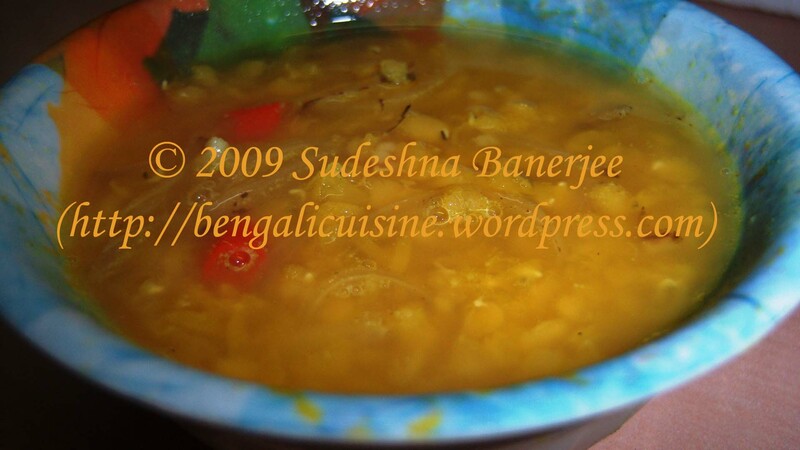 Masur dal is a lentil which is also a part of the legume family. Lentils have a very high percentage of proteins, and also essential amino acids like isoleucine and lysine. But, they lack in the other two essential amino acids, viz., methionine and cystine. Iron which is an important source of nutrition is present in high quantities in lentils and is adviced for pregnant ladies, adolescents or those who suffere from iron deficiency. Masur dal tastes good with naything, so just try it with anything you want. Check for more updates here, till then .Happy Cooking and Happy Eating . I am sending this post as a second entry to My Legume Love Affair, Seventh Helping! hosted by Srivalli, the event actually is the brain child of Well-Seasoned Cook Susan. The post on way to the FIC-January event hosted by Sunshinemom, the color of the event being Yellow this month. Also sending it to Ramki’s “Recipes for the rest of us” . My fiancee is in love with this dal, he just licks his fingers whenever I cook it, so here it goes for the lovely event, Just for you hosted by Alka. a pinch of coriander will add agreat value to the daal prepared. Don’t you think so? Coriander would definitely be a good choice. But, I like my masoor dal without any herbs, so didn’t add it. nice one. Here in Assam there’s another way we do it. We fry the onions, paanch phuran, chillies, bay leaves, salt to taste and turmeric along with the Dal- be only thenafter then add water and pressure cook for five whistles. (you might want to baste the inner wall of the cooker with ghee- adds flavour and helps cleaning up the cooker later.) Bon Apetit! I hope your husband felt happy with the food. Please let me know if you need any help on any recipe. Thank you!! My husband loved this dal.He has requested me to make it again. My daughter has allergies and it has been amazing to find your recipes that have low spices and oil. She has allergy to milk products and I was wondering do you have any sweet dishes that dont require milk. It was a pleasure hearing from you. I’ll think about something sweet without milk or milk products. Actually my sister also used to have allergies from milk. I’ll let you know soon. Anyways thanks, last weekend I prepared dal according to your recipe and it was tasty. Keep sharing your ideas. O dont say that, I believe nobody can be a poor cook, its only a matter of patience that makes the kitchen output look and taste great. hmmmmm sounds delicious, i’ll try it tomorrow. poor me, probably one of the worst cook in this world.